A new Obama speech should remind the left that only optimism can get us through the Trump years. A new speech by Barack Obama should remind the left that only optimism can get us through the Trump years. 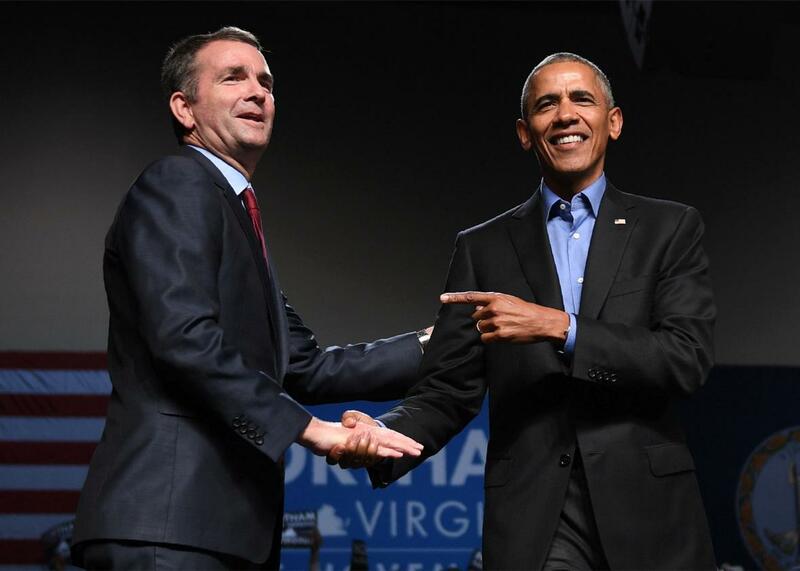 Virginia gubernatorial candidate Ralph Northam shakes hands with former President Barack Obama during a campaign rally in Richmond, Virginia, on Thursday. Among the more persistent, yet admittedly less important, mysteries of the Trump era is the complicated interplay between my mood and the national news. In some weeks, it feels as though Armageddon is nigh—and yet I somehow manage to go about life in my usual upbeat manner. In other weeks, Trump is not Trumping any worse than usual—and yet I find that the sorry spectacle of his presidency darkens my mood and slows my every step. This is how I have been feeling for the past seven days. To be sure, there is, once again, quite a bit to be depressed about. Trump’s fight with Rep. Frederica Wilson is low even by his usually low standards. The administration’s apparent lack of concern for Puerto Rico, where nearly 1 in 3 residents still lack running water and nearly 4 in 5 are without electricity, is shocking even by the administration’s usually shocking standards. But was the past week any worse than the day of his inauguration, the firing of James Comey, or the aftermath of Charlottesville? No. Perhaps, then, I am responding less to the infuriating actions of the White House than I am to the dark energy I increasingly detect in my own political tribe. Once upon a recent time, we insisted that Trump does not reflect the true nature of our country. Now, a growing consensus on the left holds that he has merely ripped the hypocritical mask off our face, revealing us for the racist nation we really are. Where white supremacy seemed like a sinister—but also marginal and retrograde—force until recently, we have now come to believe that it shapes even the most seemingly enlightened corners of the country. This presents us with a strange paradox: If Trump is so in tune with America’s ugly soul, then how can he be as uniquely bad as we like to claim? Once upon a recent time, we pledged that we would come together to oppose the president with one voice. Now, the fights among his opponents feel at least as vicious as they did at the height of last year’s primary battle between Bernie Sanders and Hillary Clinton. The left’s disdain for “establishment Democrats” is even deeper than before. Meanwhile, the Democratic Party leadership’s conviction that its own left flank is the only real obstacle to winning in 2020 is nearly as dogged. The only thing uniting the party’s warring tribes is (as the sneering responses to George W. Bush’s courageous speech drove home last week) a growing unwillingness to embrace conservative critics of the president as part of our coalition. This, too, presents us with a strange paradox. For if we hate each other quite so much, then how can Trump be as uniquely divisive as we like to claim? Once upon a recent time, we retained the hope that America’s future would turn out to be better than its past. Now, the optimists among us believe that the most plausible path to a more just society is to vanquish our domestic foes in total—though, preferably, not quite literal—war. Meanwhile, the pessimists are starting to believe that the forces of evil have somehow taken on magical powers and are sure to vanquish us whatever comes. This presents us with what is, perhaps, the strangest paradox of all. For if we barely believe that we have a chance to win, and portray a bitterly divided society on the verge of civil conflict as our best hope for the future, then how can we fault Trump for failing to be the president of all Americans? It is with these questions in mind that I stumbled upon one of the many important speeches given in the last few days—not that by George W. Bush, nor that by John McCain, but rather that by the one figure who still commands the affection of much of the left: Barack Obama. Campaigning for Ralph Northam in Richmond on Thursday ahead of Virginia’s gubernatorial election, Obama didn’t just manage to lift me out of my somber mood for a beautiful half-hour. What’s more, his campaign speech seemed to be less about getting Northam elected or taking on Trump than it was about giving solace and guidance to those of us on the left who are, like me, experiencing a dark night of the soul. [I]f we are going to talk about our history, then we should do it in a way that heals, not in a way that wounds, not in a way that divides. We shouldn’t use the most painful parts of our history just to score political points. We saw what happened in Charlottesville. But we also saw what happened after Charlottesville, when the biggest gatherings of all rejected fear, and rejected hate, and the decency and good will of the American people came out. That’s how we rise. We don’t rise up by repeating the past, we rise up by learning from the past, and by listening to each other, and by knowing that we’re all flawed. Building on this view of America’s history—one that is fully cognizant of the bad, yet refuses to let it nullify the existence of the good—Obama exhorted us to look for unity wherever we can. Instead of our politics reflecting our values, we’ve got politics infecting our communities. Instead of looking for ways to work together and get things done in a practical way, we have folks who are deliberately trying to make folks angry, to demonize people who have different ideas, to get the base all riled up because it provides a short-term tactical advantage. And so sometimes that can feel frustrating. And look, I have been in this arena for a while. But what I also know is, as frustrated as you get, the goodness of America, the goodness and decency and hard work and responsibility and sacrifice that is on display by the American people every single day in their communities all across this great country, all across this great state, people of every walk of life—it doesn’t matter whether they are white or black, Hispanic or Asian or Native American, whether they are disabled, whether they are gay or straight—there are people all across this country that want to do things better, that want to work together. It was those ideals provided to us by our founders that drew waves of immigrants to our shores, that drove waves of troops to storm beaches a world away to save democracy, it was those ideals that led generations of Americans to march for workers’ rights and women’s rights and voting rights and civil rights and LGBT rights, to expand the reach of our democracy. It’s that conviction that we can choose our own course and shape our own destiny that’s given generations of ordinary citizens the capacity – no matter how bleak things seemed, no matter how difficult things were—to keep moving this country forward. That’s who we are. That is what our founders understood: that for all of our flaws, our fate is in our own hands. That was the radical idea of America—that we decide our direction, not some king, not some despot, but us. Citizens. And our progress doesn’t always go in a straight line. Sometimes we take two steps forward and we might take a step back. They understood that, too. But the idea of America is not about going backwards. It’s about pushing forward. America is a story of progress. Do I share Obama’s optimism? Or does his hopey-changey spiel, soothing as it is, ring increasingly hollow in an era during which authoritarian populism is rising not only in the United States but also around the world? I’m afraid I don’t have an unequivocal answer—or to be more precise, I have two unequivocal answers that just so happen to contradict each other. As an academic studying the likely fate of liberal democracy, I am deeply worried. The lingering legacy of racism in our country is deep. The new forces that are now tearing asunder our society, and so many other liberal democracies around the world, may be deeper still. Perhaps Obama is right to describe the last two centuries of American history as a story of two steps forward, one step back. And perhaps he’s also right to believe that the next century or two will bring even more progress. But unlike Obama, I don’t think we can be sure about this: For all I know, we might be about to take 10 or 20 or 100 steps back. And yet, as a writer and an activist on a mission to save the ideal of a liberal, multiethnic democracy, I find Obama’s approach to politics more appealing than ever. In this dark night for our nation, it is difficult to summon the optimism and the idealism to believe that we can reconcile the warring factions of the left, much less the country as a whole. But as a matter of practical politics, I have trouble seeing the alternative. For it is only if we summon the courage to take the same leap of faith that we can regain our hope of a better future and offer Americans a vision of a better country that they have reason to embrace.